For displaying the physical posters, I decided to rotate them in a single frame and to store the bigger ones at the rear of the frame. I never got to see a Snap frame (which allows the front to be opened) and instead purchased a large 36 x 24 inch beech frame from the Frame Company for about £34 and £7 next day postage. The backboard is secured to the edge of the frame by folding down 4 or 5 metal strips along each side, and I figured these would be flexible enough to accommodate the thickness of the 6 or 7 posters I wanted to store in the frame. This turned out to be the case – with enough room for a few more if necessary. I duly constructed the montage I had been planning out of the colourful 10-20 year old covers of “Interactions” – the ACM magazine for the discipline of Human Computer Interaction (having scanned their contents it seemed a waste to just throw the covers away). 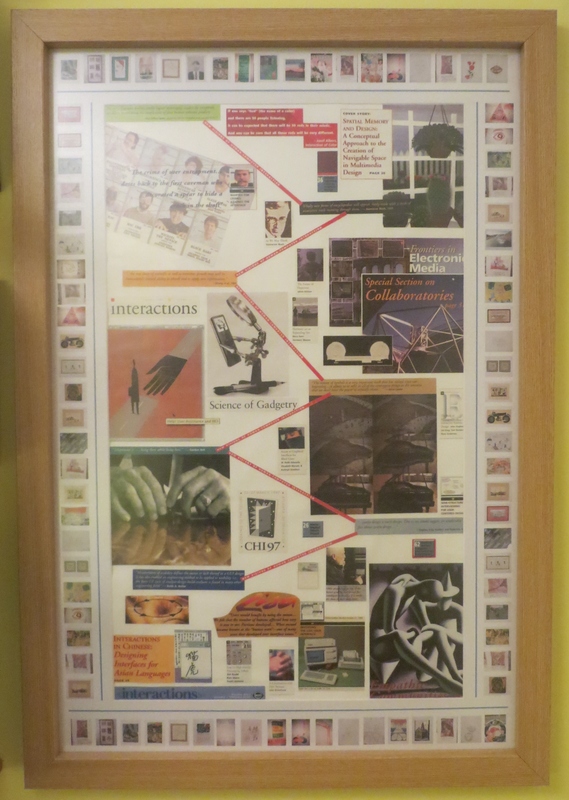 The resulting 30 x 18 inch collage is quite informative and interesting but not particularly pleasing to the eye. Ah well, you can’t win them all. Anyway, at least it did provide a focal point and incentive for obtaining the frame – and it will only be on display some of the time as it takes its turn in the rotation of the posters and pictures through the frame – provided I do actually perform the rotation – only time will tell. I didn’t really explore the use of Snap front loading frames for the reasons of cost, looks, the lack of any product to look at, and not being able to understand how multiple posters could be held securely (ie. without slipping down) while being stored behind the picture being displayed. Having said that, and despite my desire to try out storing posters/pictures at the back of a frame for rotation, I do believe that probably the best way to store most posters and pictures is in a large art case – provided you can get one big enough to take the largest size poster that you have. To emphasise the point that the purpose of the frame I have purchased is to rotate posters and pictures through it, thumbnails of all the posters and picture not on permanent display in the house, have been printed out and glued around the edge of the mount in the frame. In principle, one could select from the thumbnails, which poster or picture to display next in the frame. Although the net result is quite busy as you can see below, it does do the job. Perhaps it would look better with something other than the collage on display in the middle of the frame.